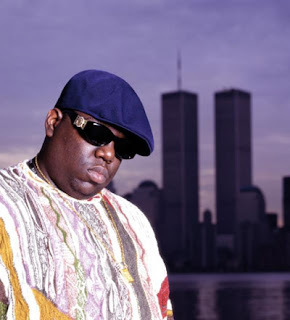 Today marks the anniversary of the death of Christopher "Notorious Big" Wallace,artist, father and inspiration to many. I remember like it was yesterday walking home from school with headphones, downtown brooklyn listening to his first album "Ready to Die". A favorite of mine was "Gimme the Loot" , a graphic depiction of two stick up kids catching unsuspecting victims or vics. Big ushered in his own style of rap, describing himself as black and ugly as ever, he embraced his size and blackness but still had a player's smooth demeanor with his mastery of words, painting pictures every time he touched a track. Prior to Big's arrival on the scene, i will have to say that west coast rap dominated for the most part but after him the focus shifted back to the east. Big was one of the few rappers who could give you a grimy tale,make you laugh and impress the ladies all on one album. His greatest strength was storytelling which literally could put you right there in the as clearly shown on tracks like Juicy,I got a story to tell and Somebody's got to die. Big only was able to release Ready to Die before his death but all his music has still been able to touch fans as if he were still here today.